Get nine months of specialized training for the field! Advanced Missionary Training (AMT) is missionaries training missionaries. It has been developed and refined at Baptist Bible Translators Institute (BBTI) for more than forty years. Most instructors have ministered on the foreign field and have first-hand knowledge and understanding of mission work. Classes are enhanced by their experience. Although scholastic achievement is important, it is not paramount. Necessary theory is taught, but our focus is on the knowledge and practical tools that are needed to get the job done. It is very possible to speak a new language without a distracting accent. An accent occurs when we speak a new language using the sounds of our mother tongue. The Spanish t, for example, is different from our English t. The key is to recognize the sound differences in the new language and begin speaking them exactly like the native speakers from day one. Advanced Missionary Training begins with Articulatory Phonetics, a linguistic course with extensive instruction and practice in identifying and reproducing all these sounds of human speech. Other linguistic courses include the studies of how different languages form words (Morphology) and sentences (Syntax) and how to give an unwritten language a well-suited alphabet (Phonemics). Hannah had been on her field of service for three months. Leaving the church one day, she tripped and fell. Everyone around her, even those she considered friends, laughed loudly. Hannah was relieved that she wasn’t really hurt, but it did hurt to be laughed at. What was so funny? Why did those people act that way? After a year of hard work Hannah had learned to carry on a conversation. Then a troubled young girl from church requested her advice about a serious matter. Hannah understood all the words, but she could not quite figure out what the girl was asking her. Clearly, the dictionary meaning of words was not enough; there were cultural implications beyond her understanding. Social interactions are a learned behavior. Each people group has their own patterns of living, their own beliefs and values, and their own interpretations of events. This is their unique culture. In order to feel comfortable and in order to effectively communicate the Gospel, the missionary must learn it. 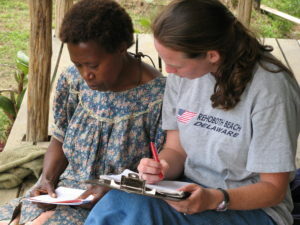 Advanced Missionary Training includes Cultural Anthropology, a class in which students learn a method to actively study cultures. Learning a new language is a big hurdle for most American missionaries. The class in language acquisition gives a jump start for those heading to language school and a workable plan for those who will not have access to language school. In this class, the student uses the skills he acquired in Articulatory Phonetics to practice working with an actual foreign language. He learns a step-by-step method that he can use to learn any language in the world. In the first six to eight weeks on the field, the missionary masters the sounds of the language and can pronounce words and phrases like a native. With this base to build upon, he can proceed faster in vocabulary and grammar. There are thousands of languages with no language schools. 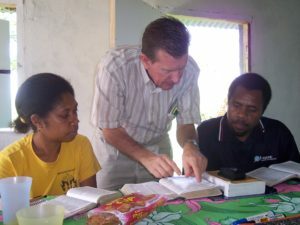 Advanced Missionary Training enables a missionary to learn a language without books, schools, or teachers. He is even prepared to learn an unwritten language. Did you read your Bible today? Billions of people didn’t. A very large portion of them had no chance to read a Bible because no Scripture exists in their language. We have a wonderful opportunity to change that. Few Baptist missionaries attempt Bible translation because they feel unqualified to handle such an awesome responsibility. In Principles of Bible Translation, missionaries learn to deal with the translation issues and challenges. Instructors discuss ways to deal with them and produce an accurate, understandable, formal translation of the words that God originally inspired. What if a missionary’s target language already has a Bible? He will still need to know how to translate. In reality, he will do it every day either in writing or speaking. Specialized training can mean the difference between success and failure on the field!